The expression Divide and Rule describes wisdom that dates back at least 2000 years. The principle has been applied successfully over the centuries in politics, warfare and sociology. So, as it became abundantly clear this week that the Bureau of Land Management’s current strategy for managing wild horses on the US western rangeland is becoming increasingly unsustainable, it struck me as darkly ironic that one of the deepest divides in the whole debate is among those who advocate for the mustangs. This division has little to do with the Bureau of Land Management, the ranchers, or the increasingly drought-prone habitat the rangelands provide for the horses. It relates squarely to the issue of whether the advocates consider contraceptive measures to be an effective and humane method for controlling horse numbers. So, while there is almost universal agreement that the BLM’s strategy of mustering horses and placing most of them in long-term holding facilities is both costly and unsustainable, it seems the advocates struggle to agree on what measures would best control numbers. There remain many issues in the whole debate around wild horses. 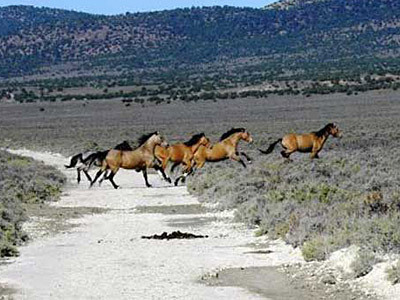 Some advocates argue that the current management levels used by the BLM are too low – and the authors of a major 2013 National Academy of Sciences report into wild horse management struggled to identify a science-based rationale’ for how these levels were established in the first place. That said, current estimates indicate that wild horse and burro numbers on public rangelands are now 2.5 times greater than those stipulated appropriate management levels. Unfortunately, the net result is that uncertainty remains over what horse numbers are appropriate, and what impact the animals are having on the habitat. Ranchers and wild horse advocates repeatedly clash over the question. But the key issue that divides – and therefore weakens – those who advocate for the wild horses and burros is the issue of contraceptive use. And that is unfortunate. Because the numbers released by the BLM this week show clearly that the issue of wild horse management is rapidly coming to a head. Longer-term and more affordable solutions need to be found. Polls indicate that the wild horses enjoy majority support among Americans, who appreciate their heritage and intrinsic value. However, the revelation that the lifetime care of the 46,000 mustangs being held in captivity was likely to exceed $US1 billion poses a real risk that such ongoing costs might start to erode public support. It is hard to escape the conclusion that important decisions are going to be made in the coming year over the future direction of the wild horse and burro management program. Wild horse advocates are hardened campaigners, well used to the bruising encounters that arise in seeking to protect the interests of wild horses. But their apparent inability to find consensus on the issue of contraception is a major hurdle, which could well prove to be a telling factor when important decisions on the program are made. The conventional wisdom is that we should follow the science, but in this case it has done little to close the gap between the two sides. And I’m not quite sure why. Is the science contradictory on the issue of contraceptive control? Are some groups choosing to cherry-pick the evidence in support of their position? Or is it a more subjective question: That is, contraceptive use may not be ideal, but some consider it is better than the alternatives. I simply don’t know. The Animal Fertility Vaccine Information Center sent out an email yesterday with the subject line, “Let’s end the cycle of crisis”. It’s a sentiment that everyone can support, regardless of their position on wild horses, or, indeed, their position on contraceptive use. For now, all we know is that the current strategy is not only failing, it is growing ever more costly by the year. For me, having reported on the issue for many years, the most disappointing aspect is the limited progress made in making meaningful reform within the program. Those who support the wild horses should be worried, because the inevitable reforms might not necessarily equate to a better outcome for the horses. Contraception of wild horses is contraindicated for at least three reasons. First, more than 70% of the herds are restricted to arbitrary management levels (AMLs) that are below minimum-viable population. Second, BLM’s “data” has been exposed as fraudulent — with herd-growth rates exaggerated many times beyond the biologically possible. Third, PZP (touted as “humane”) causes autoimmune disease. Advocates would do well to ask themselves: Why would we contracept herds whose population is inadequate for genetic viability? Why would we contracept herds based on corrupt, falsified figures? Why would we use a product that causes ovarian dystrophy, oophoritis (inflammation of the ovaries), ovarian cysts, destruction of oocytes in growing follicles, and depletion of resting follicles? BLM has cleverly divided the advocacy, and is now spreading the Big Lie about the costs of the program — a supposed one billion dollars over 20 years — another bogus number predicated on phony figures and false assumptions. Remove 99% of the stallions and colts and geld them. The gene pool is already too low. This would just cause inbreeding. The lead stallion is important for the welfare of the bands and prevents other stallions from breeding his mares. He also will not breed his daughters and keeps other studs from doing so as long as they are in the herd. I have no problem with gelding a horse and birth control for mares, but than bring them back. No mustang belong into avkilling pen or in human hands.